Americans spend an extra $3 billion on fuel because vehicles are heavier than they were in 1960. The world’s drivers consume an extra 39 million gallons each year for each pound of added vehicle weight. The American Automobile Association’s (AAA) research shows that the annual average cost of driving a small sedan is $6,320 per year versus $10,448 for a four-wheel-drive mid-size SUV. Heavier vehicles result in lighter wallets. Cars need to go on a diet. SUVs need a crash diet. A weight savings in the frame and body leads to other savings. A lightweight auto requires a smaller engine and powertrain, which in turn requires less fuel weight. The less a vehicle weighs, the less fuel is required. Websites like fueleconomy.gov compare the mileage of various cars, trucks, and SUVs. For many models, the actual results of drivers are included. Vehicles can be better designed. Minor reductions in weight and drag can improve fuel economy up to 50 percent for a cost of a couple of hundred bucks. Even heavyweight SUVs can be put on a diet. GM made its Tahoe’s body 400 pounds lighter by using aluminum hoods, tailgates, drive shafts, and bumper structures. The body was made more aerodynamic through wind tunnel studies. GM then saved more weight with new seat materials, electronic power steering, and a new hydraulic system. In Europe, Volkswagen has sold diesel cars that get close to 80 mpg. These cars are smaller than United States offerings with lightweight powertrains. Leave the heavy metal behind when you buy your next car. Your current vehicle is probably made with steel rather than lightweight aluminum. 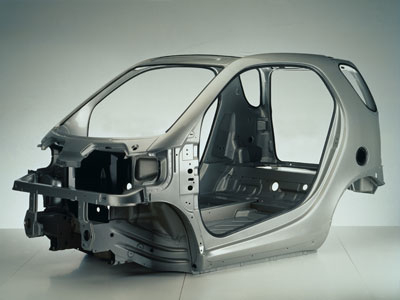 The average amount of aluminum used in European cars rose from 110 pounds in 1990 to almost 300 pounds by 2005. The two million tons of aluminum components put in European cars saved over 250 million gallons of fuel annually and 40 million tons of CO2 emissions over the lifespan of the vehicles. With the growing use of aluminum, composite materials, and aerodynamic design, we will see diesel cars delivering 100 miles per gallon and more if they are hybrid. Using carbon fiber makes vehicles even lighter than aluminum. Carbon fiber requires half the weight of steel and improves protection of passengers and driver. My bicycle is carbon fiber, making it easier to get up hills. My golf clubs use carbon fiber; unfortunately, nothing can help my golf game. One carbon fiber sports car, the Tesla Roadster, has been recognized with design awards from Time Magazine to Popular Mechanics. In announcing the awards for Best Product Design, BusinessWeek proclaimed, “The Tesla Roadster electric car took the gold with an exciting shape by the Lotus Design Studio in Britain and an all-electric plug-in engine. The Tesla is the un-Prius: a hot, fast sports car that’s also green.” Tesla achieves over 200 miles per electric charge because the sport car’s body is made from light carbon fiber and the frame is made with aluminum.